This photo was given to me by Sandra Adcock. It shows Ann and Aunt Migs standing outside Piggs Corner in Civic Square in 1955. Re the article on Piggs Grocers I think that it was the gas mask office during the war. Piggs were huge in Thurrock with the mobile vans coming around daily . The couple who were on the van I believe were Mr and Mrs Richardson who lived in Melba Gardens.. Looking at some of your other subscribers I well remember Bairds the Bakers and when I started work I would catch the 5.36 train from Tilbury Dock and en route call at Paintons Bakers in Dock Road for a hot loaf and then a few doors along to Elvins to buy some beef or ham to put in it before catching the train. In those days Elvins made hundreds of sandwiches for sale to the Dockers and I remember my mother sending me there for sandwiches when meat was short and she would take the sliced meat out and we would have it with vegetables for our dinner. Whilst on pigeons My Great Uncle Wally Connor lived in Feenan Highway and was a great pigeon man. There was a family story that when he went off to World War 1 he left my grandmother with his racing pigeons an d when he returned after the war they had gone, ending up on the dinner plates for the children. I believe the gents outfitters next to Bennetts Shoe shop was Dennis Raiment. The bakery was out the back and you were able to buy the bread (before the shop opened) just as it came out of the oven. Still can remember the smell and that was many many years ago. my mum got my first pair of shoes from Bennetts. Yes, the Bata Shoe Store was managed by my Dad, Cyril Bennett. I don’t remember the hankie peeping out of his sleeve or the ‘ oh so posh ‘ bit, but he did enjoy puffing his cigars in the shop !! I don’t remember the ’53 floods as I was a bit too young but my brother Tony recalls that time. Some years later I remember rushing down to the shop due to a smaller flood and placing sandbags in front of the door. To no avail ! I dont know the name of the Gentleman’s Outfitters next door but the owner was Fred Goodwin I think. We have loads of photos and newspaper cuttings and copies of the Bata Record which I will put on website shortly. My Grandfather, William, had the shop before my Dad. My Uncle Harry ( Elson ) was a foreman in the Docks, and my Uncle Joe ( Elvin ) had a wonderful shop in Dock Road that sold everything from big pots of sherbert, ( which us kids used to stick our fingers in and lick the sherbert off, and the yellow stain would last for days !! ), to meat and veg etc. I will add more when I have time. Mr Bennett – I was at school with his son who’s name was – Tony ! But not the singer of course. Pigeon Rings – When the birds hatched, metal rings with a registration number were put on one of their legs. Later when they went racing a rubber ring (with a race number) was put on their leg and with the metal ring this identified their entry in the race. When the birds returned from the race, the rubber ring was removed and put in a thimble which was then inserted into a racing clock to record the time that pigeon finished the race. Each owner them took their clocks to a club HQ where the “tachograph” style paper was removed from the clock and scrutinised to determine the race winner. Nice photo’s Barry, my dad died 1955 when I was about 11 or 12 have no photo’s, but I remember him waiting for the bird to come home, then coax it down with food. He would take it to civic square (I believe) to register time. If I remember correct the birds used to have a ring on their leg with a number on which identified them. Does anyone remember “BATA” shoe shop managed by the ‘oh so posh’ Mr Bennett with his hankie peeping out from the sleeve of his jacket. Here are a couple of pictures of my Dad, Reg Banks, with his pride and Joy – Racing Pigeons. Cramphorns – I did just the same for the pigeon food. There were a lot of lofts in Tilbury in those days. I used to take my Dad’s pigeons on my home-made trolley, every Friday in the summer, to Tilbury Town (Dock) Station to earn some pocket money. From The Station the baskets of birds would be taken all over England and even the northern coast of Scotland. Any living person, apart from my Dad, or animal were banned from the back garden on race days. Great memories. Audrey, Cramphorns you reminded me that I used to get pigeon food for my dad’s racing pigeons ( rats with wings) in the early 50’s. Was it Bairds or am I getting confused with the shop in Grays ? 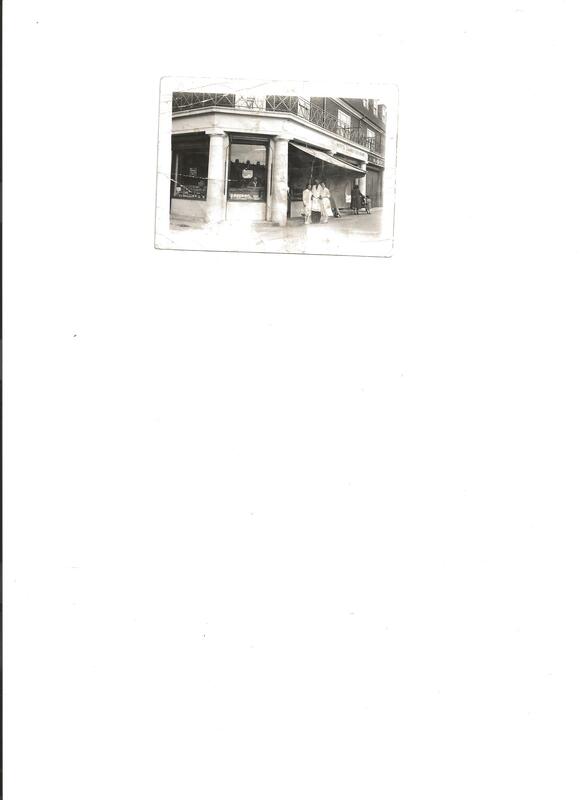 The shop was called Bairds and they made the best jam doughnuts ever, I had a friend who’s mum used to work there, a Mrs Riches, they also had branches in Grays and Chadwell I think. The only memory I have of Pigs Grocery store was buying a few pence worth of broken biscuits from a square tin with a glass lid. Happy days! Does anyone remember the bakers shop about half way down the parade with the ovens round the back, we would buy a small hot loaf for 6 pence bit on a Saturday morning.